What is the diameter of the handle of DF-SA400-ORB, from the widest part to the narrowest? It appears to taper. What is the diameter of the handle of DF-SA400-ORB, from the widest part to the narrowest? It appears to taper, and I am concerned that it may not fit in our current standard holder. Thanks for your time! 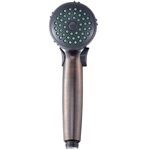 Below is a dimensional diagram of the DF-SA400-ORB Shower head, it shows multiple diameters of the handle. Click photo to enlarge.